Charlene Ninni of Center Valley, PA suffered with excruciating and debilitating pain which would travel from the inside of her ankle, throughout her foot, and sometimes all the way to her hip. For almost 2 years, she sought the advice of a number of orthopedic surgeons, none of whom were successful in relieving her foot and leg pain, or her swollen ankle. The tarsal tunnel is found along the inner leg behind the bump on the inside of the ankle. The simple things most of us take for granted, like walking up the stairs or food shopping, had become difficult to impossible for Charlene. She had learned to wait as long as possible before doing anything that required walking, and she asked frequently for assistance from friends and family. With one of her ankles all but useless, and in almost constant pain, life had become challenging. One night at a Lehigh Valley IronPigs game, while paging through that night’s program, she saw an ad for a seminar that Dr. Adam Teichman of PA Foot and Ankle Associates was conducting on foot health. When Charlene showed up at the seminar in the walking boot her most recent orthopedic physician had given her, Dr. Teichman couldn’t help but start a conversation with her. They discussed her symptoms, he ballparked a few possible reasons for her condition, and he recommended she see him for an exam and diagnosis. After Charlene’s exam in the PA Foot and Ankle Associates office, Dr. Teichman’s diagnosis was tarsal tunnel syndrome. He recommended surgery as the best treatment option to relieve Charlene’s pain. Charlene agreed to the surgery, and today she couldn’t be happier with the outcome. Watch Charlene’s video testimonial below in which she discusses her symptoms and tells us how great she’s feeling now compared with 2 years ago. Tarsal tunnel syndrome (TTS), also known as posterior tibial neuralgia, is a compression neuropathy and painful foot condition. The tarsal tunnel is found along the inner leg behind the bump on the inside of the ankle. Through this tunnel passes a collection of arteries, nerves, tendons, and muscles. 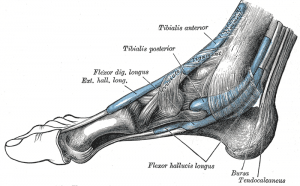 Inside the tarsal tunnel, the tibial nerve splits into three segments – one segment continues to the heel, and the other two continue to the bottom of the foot. When the tibial nerve becomes entrapped or “pinched” in the tarsal tunnel due to inflammation or swelling, numbness may be felt in the foot radiating all the way to the big toe and the first 3 toes. Additionally, pain, burning, tingling, and electrical sensations may be felt in the base of the foot, ankle, or heel. Visit the PA Foot and Ankle Associates website for more information on Tarsal tunnel syndrome. ← I Have Pain In My Heel – How Can I Treat It?